Ozarks Technical Community College’s Fine Arts Department will present: The Traveling Symphony’s “A Midsummer Night’s Dream” in April. The immersive theatrical experience will take place at several outdoor spaces around Springfield. All performances are free and open to the public. Inspired by “Station Eleven,” a novel by Emily St. John Mandel, the plot follows a group of nomadic performers on their quest to keep a post-apocalyptic civilization alive. The audience, cast as survivors in the world of Station Eleven, will be entertained by William Shakespeare’s classic comedy from within a Traveling Symphony encampment. Audience members are encouraged to bring lawn chairs or blankets to the outdoor production. All performances begin at 6 p.m. 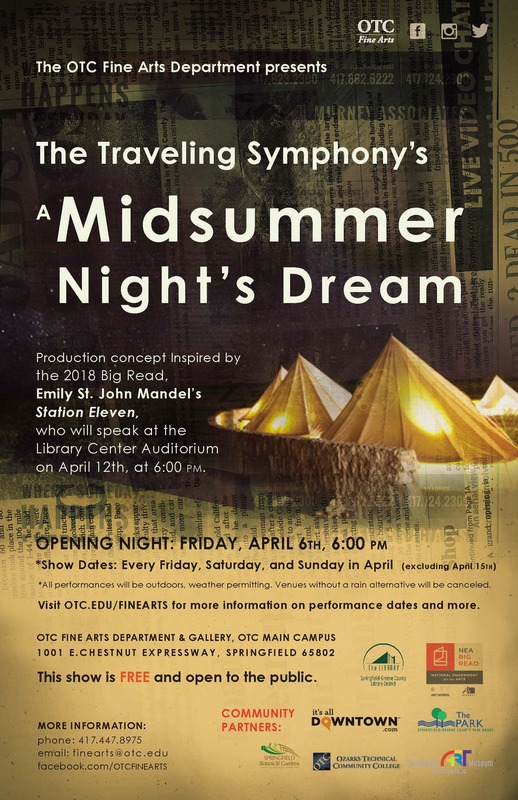 The Traveling Symphony’s preshow acts begin at 5:30 p.m.
Additionally, Ms. Mandel, author of “Station Eleven,” will discuss the novel that inspired OTC’s production on Thursday, April 12 at 7 p.m. at the Library Center. The Traveling Symphony will perform a 45-minute showcase prior to Ms. Mandel’s speaking engagement. For more information about the OTC Fine Arts’ production: The Traveling Symphony’s “A Midsummer Night’s Dream,” visit otc.edu/finearts.